In the last two verses of Luke chapter 14, Jesus talks about salt that has lost its flavor. Numerous explanations have been given us for how salt can lose its flavor, and some sound pretty close to accurate, while others do not (IMHO). So I am going to offer my own. Julius Sterling Morton was a philanthropist and early settler of Nebraska. Deciding that it was much too flat, he began the business of planting enormous amounts of trees there. He eventually created a 400 acre arboretum, which has grown into a 1700 acre wonder of living trees, bushes, etc. Grover Cleveland made him the 3rd U.S. Secretary of Agriculture, and a notable addition to his accomplishments was the founding of Arbor Day. In 1911, one of his sons, Joy Morton, turned the business he had bought into the incorporated Morton Salt Company. The slogan “when it rains, it pours” was adapted from an old proverb. The little girl holding the umbrella in the rain was created with the slogan. The company had begun adding magnesium chloride to prevent caking when it became humid. It worked very well, but in a shaker you will still sometimes see that people have put a few grains of rice in to absorb moisture and prevent clumping, as it is out of the box and it sits for a long time. The salt we buy these days with that little girl and the umbrella (or a more generic brand, if you prefer) can be bought for about 50 cents a box today. It is refined salt, which removes many natural minerals, and various companies add different chemicals for various reasons. But the salt that was around in Jesus’ day was unrefined salt – just the way God made it. You can buy unrefined salt today, but the same amount of unrefined salt as what you get in that round box will set you back anywhere from $6 -$15. But many of us believe it is much healthier for you. This unrefined salt contains many minerals (some would call “impurities,” which is a bogus assessment). 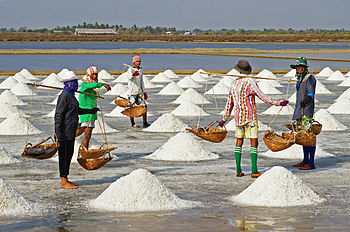 In those times, if the salt became moist and started to dissolve over a long period of time, it would eventually become bland in taste, as the ratio of sodium chloride to mineral content began to become smaller. When we first become Christians – assuming we are truly committed – we are full of zeal and enthusiasm. But as time goes by and the cares of this life begin taking their toll, some of that zeal and enthusiasm can easily be lost. It is easy for us to begin the race and then slow down over time – or even veer off the path. If we are not careful, we can lose our way, and our faith can become in vain – useless to anyone who might otherwise be positively influenced by our example. The best way to keep the “moisture” of life’s troubles and temptations from leaching away our “saltiness” is by keeping the light of God’s word in our lives and nurturing our relationships and love with other Christians. We need a daily dose of reading God’s word, and fellowship that not only gives us encouragement, but also accountability.